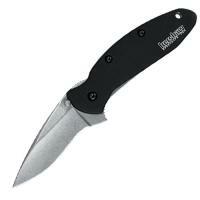 The Kershaw 1620SWBLK Scallion takes this classic knife design and gives it a brand-new update. It features redesigned black aluminum handle scales that make it easy to grip and resist wear. The blade is still the same, with a sharp drop point shape made from high-quality, high-carbon steel that holds an edge easily. It includes a SpeedSafe assisted opening mechanism for rapid deployment, with an ambidextrous flipper that is easy to operate one-handed. The textured thumb rest and index finger indentation enhance control for precise work. The liner lock keeps it locked into place once deployed, while the Tip-Lock slider prevents it from opening accidentally. It features a single-position pocket clip for portability.